Saturday night I had a little bit of free time before bed, so I wanted to start in on my Mythic GME solo game using Risus. I was inspired by Risus Monkey, so I will try to use his template when keeping track of my solo sessions. I really only had time on Saturday to do a brief character creation, which lead to some interesting story elements that I will have to include in the game. Hopefully I will have some time tonight to play some more. So, for your entertainment, here are the notes from my brief play Saturday. When creating my character, I thought of two things that I would like to really define that character. I chose Alchemist and Wild Mage, because I was in the mood for this type of character. (The guys who play with me will laugh because they say I am always in the mood play a magic user.) So I listed these two as my first two clichés. There was nothing else I was set on playing, so I decided to roll up random clichés for my last too. Using my Mythic GME program, I rolled a d100 and got 97. Searching the list of random clichés that I had, I found it to be: Visitor from the future…hmm, okay, that’s odd, not sure where to go here. At this point I was going to ignore this roll and just roll again, but decided to let the dice lay where they were rolled…or something like that. I think it will add an interesting twist on the whole adventure. So I decided that my character comes from a time where the world is more advanced, an Eberron-like setting, with technological advances, through magic, and traveled back to where the world is far less advanced and developed. Question: Did I come back in time on purpose? 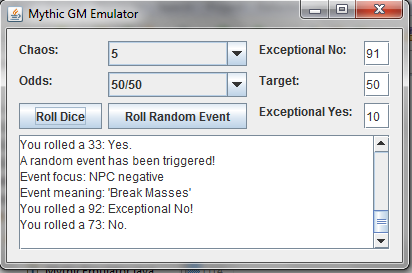 Answer: You rolled a 96: Exceptional No! Okay, so not only did I not come back on purpose, but it was also completely against my will. Maybe I triggered some ancient trap, or perhaps someone maliciously sent me back in time. Now I decided to ask a clarifying question, which had to be more complex, so I used Risus Monkey’s method of viewing a random page on a wiki to find the answer. I picked the World of Warcraft wiki, because I thought it would be fun. Complex Question: How did I get sent back through time? Answer: (Using Wowwiki.com random page) I was sent to the page “Master Summoner“. Very interesting, so then I was summoned back through time… Okay, I see the beginnings of a story here. Let’s get my last cliché and finish my character, then com back to this for the intro storyline. Rolling on the random cliché list to get my last one, and I rolled a 35. Ex-Mercenary, I like it and can work with this cliché really well. What happened to the rest of the Mercenaries I wonder? Guess it probably doesn’t matter since they would be far into the future. I then found a random name generator at Seventh Sanctum and got the name Annette Mia Knox . I wasn’t expecting to play a female character, but I’ll roll with what I get. I will probably be using Seventh Sanctum a lot for this game since it has a lot of really neat random generators. This adventure looks like it is going to be a lot of fun to play… Let me know what you think! As you can see, it is just a basic program, but everything has worked well so far in the testing I have done. I plan to play a solo game soon to really test it out, using Risus Monkey’s method for solo play.